Styletto is the latest hearing aid from Signia. 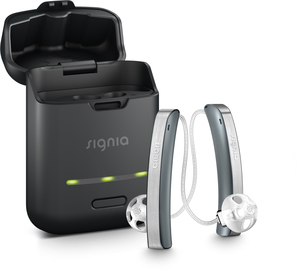 Equipped with all the benefits of the new Signia Nx platform, Pure® 312 Nx keeps the wearer’s own voice and remaining soundscape in perfect balance. This way, it offers the most natural sound and highest hearing performance in a small, elegant housing. The unique laser-edge antenna design delivers the smallest possible size for Bluetooth®-based direct streaming and remote control via the myControl™ App without compromising on the highest hearing performance. Call us for more information and to schedule a free consultation! SpeechMaster – enhancing speech in every situation. More than a single feature or innovation, SpeechMaster is a collection of algorithms that work in concert to achieve less listening effort. SpeechMaster analyzes the acoustic environment and employs the first technology that is clinically proven to isolate the target speaker from unwanted surrounding noise and other speech. SpeechMaster acts as a conductor orchestrating digital noise reduction, directionality, and amplification to reduce listening effort. This is achieved by reducing noise and highlighting the dominant speaker’s voice in speech environments throughout the day. HD Music – maximizing enjoyment for music lovers and musicians. HD Music takes full advantage of the high-frequency-enhancing 12 kHz extended bandwidth found in the universal program. Specially created to deliver outstanding music fidelity, HD Music features three dedicated music programs that are uniquely designed to enrich the sound quality of music and to maximize the enjoyment of music, whether the wearer is listening to recorded music, attending a live concert, or even performing music. EchoShield – softens echoes for reduced listening effort. Available in the reverberant room program, EchoShield analyzes both direct and reflected sounds, and ensures softer reflections are not over-amplified. With EchoShield, the effects of reverberation in atriums, hallways, lecture halls, and places of worship are lessened, thus improving ease of listening. TwinPhone – improving phone conversations everywhere. Sixty percent of mobile phone users hold their phones to their ear, even when there is a hands-free option. ** TwinPhone is the optimal solution for these wearers and is compatible with all phones, whether Bluetooth®-enabled or not. When a magnetic signal is detected, the TwinPhone feature automatically transfers the acoustic phone signal to the contralateral aid via the wireless link, which helps reduce listening effort on the phone. CROS/BiCROS – ideal for wearers with single-sided deafness. All primax CROS and BiCROS solutions are based on e2e wireless™ 3.0, which has set an industry benchmark for low energy consumption. A CROS Pure® transmitter is worn behind the unaidable ear and the audio signal is wirelessly transferred to the primax hearing aid on the other side, thus allowing the wearer to hear sounds from both sides. The Siemens Aquaris is the first waterproof instrument available. It also has the Best Sound Technology so you get superior sound quality in a durable product! 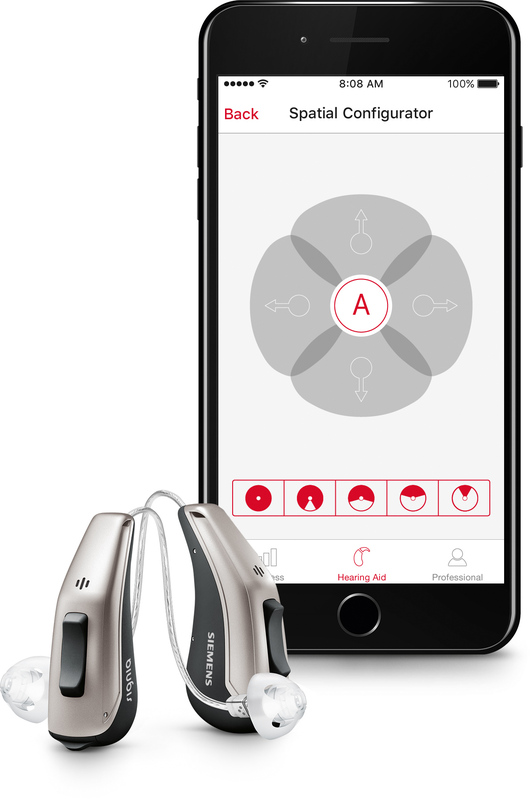 The World’s First Hearing Aid to Use Motion Sensors. •Effortless hearing that may even be better than normal hearing in difficult listening situations* with primax™ Star. •Unique situation-specific hearing when you’re on the move, thanks to motion detection technology. •Direct streaming of high quality audio in stereo, via 2.4 GHz Bluetooth from the iPhone, and TVs coupled with the StreamLine TV transmitter. Bluetooth® word mark and logos are owned by the Bluetooth SIG, Inc., and any use of such marks by Sivantos is under license. Other trademarks and trade names are those of their respective owners.